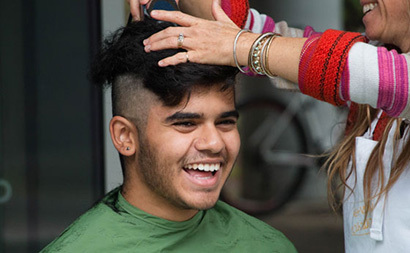 A smiling shavee takes part in the Genomics Institute head-shaving event. Aurora helps the barber shave Katrina's hair. 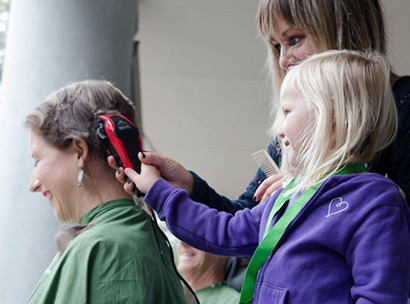 With her son Grant in her lap, her father getting shaved in the seat next to her, and her daughter helping guide the razor, Katrina Learned’s head-shave became more than a fundraiser — it was a moving family moment. Katrina was the top fundraiser at the St. Baldrick’s head-shaving event, raising just over $14,000 for childhood cancer research and helping propel the UC Santa Cruz Genomics Institute to the top of the charts for the second Battle of the Bald, an annual college charity fundraiser hosted by St. Baldrick’s, a childhood cancer foundation. Katrina’s daughter Aurora was diagnosed with neuroblastoma, a type of childhood cancer, when she was 2 months old. Aurora’s hair loss as a result of chemotherapy is something Katrina remembers vividly. It’s that kind of treatment she is working to change — with her career, and through her fundraising for St. Baldrick’s. Katrina works for the Treehouse Childhood Cancer Initiative, a Genomics Institute research project project supported by St. Baldrick’s funding. Using comparative genomics, Genomics Institute researchers hope to create more individualized and less toxic methods of treatment for kids with cancer. 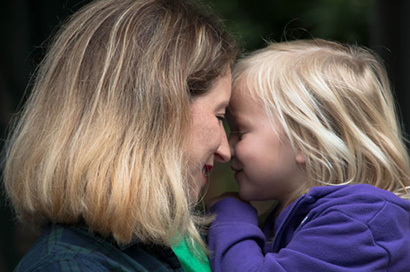 Combining her background as a genomics data analyst with her desire to find cures for pediatric cancer, Katrina teamed up with Genomics Institute researcher Olena Morozova, and the Treehouse Initiative was born. Katrina wanted her shave to make a big impact, so she set a firm goal and didn’t back down. But what would a successful event be without a superstar volunteer event organizer? Six months ago, Michelle was just starting her new job with the Treehouse Initiative. Her first big project? Organizing their St. Baldrick’s event. It was no small feat, but all the hard work paid off. Now, the UC Santa Cruz Genomics Institute gets to take home the Bald Cup — and Katrina, as the top fundraiser in the Battle, will get a free year of haircuts, courtesy of St. Baldrick’s national partner, Sport Clips Haircuts. At the end of the day, the cause is what matters most — to St. Baldrick’s shavees, volunteers, and the Treehouse team. Because of childhood cancer research, Aurora is now three years cancer free. Now, she has a chance to grow up — a chance Katrina believes all kids with cancer deserve to have. That’s what inspires Katrina to keep fundraising, and to keep doing the work she does for the Treehouse Initiative. UC Santa Cruz was one of 37 colleges and universities across the United States that took part in St. Baldrick's Battle of the Bald, a competition to see which school could raise the most money for childhood cancer research. UCSC was announced the winner after raising more than $28,000, with 37 people shaving their heads during the campus event. The tournament raised more than $235,000 collectively. As the largest private funder of childhood cancer research grants, the St. Baldrick's Foundation believes that kids are special and deserve to be treated that way. St. Baldrick's funds are granted to some of the most brilliant childhood cancer research experts in the world and to innovative explorers who bring with them the promise of a future free from childhood cancers. Kids need treatments as unique as they are, and that starts with funding research just for them. For more information, visit StBaldricks.org.